Our results - the highest percentage of un-churched visitors we've seen in a long time. YAAY!!!! I'll share the fun games we played, all the signage we made, etc. 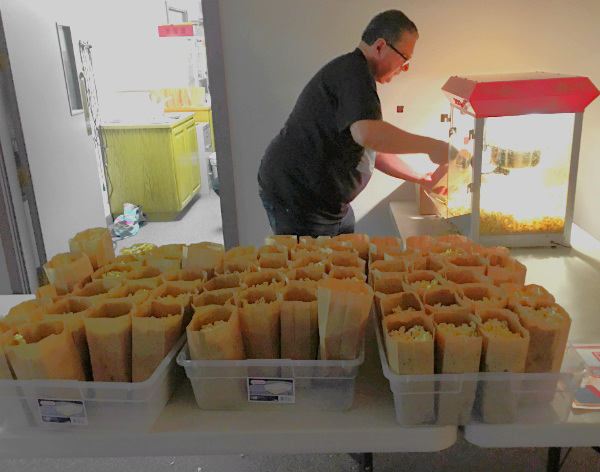 - everything you need to easily host a fun movie night at your church, too! Do you struggle to get un-churched families to come to church? 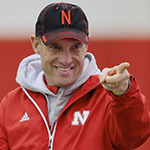 Well, of course you do – that’s a dumb question. Us too. Our annual Family Staycation (think “VBS” but with activities for adults too) has been attracting fewer and fewer un-churched families. So, this year we’re trying some new activities. We thought – what do un-churched families already do, that wouldn’t seem “weird” to them? And going to see movies was one obvious answer. 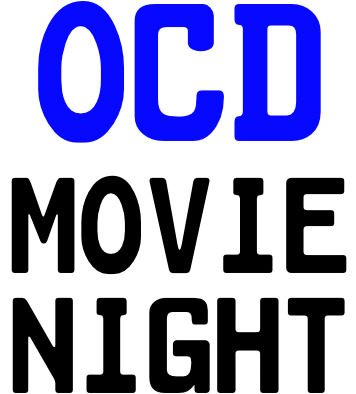 If you want to try a family movie night, I’d like to share some of our resources with you. Keep reading for the link to get them. 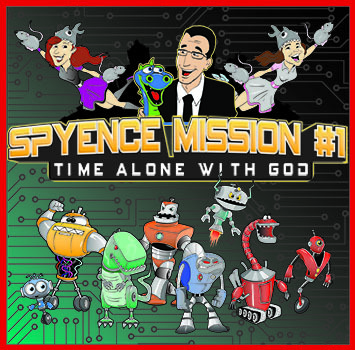 We surveyed families in our church and asked them which of the following movies they would be most likely to come to. 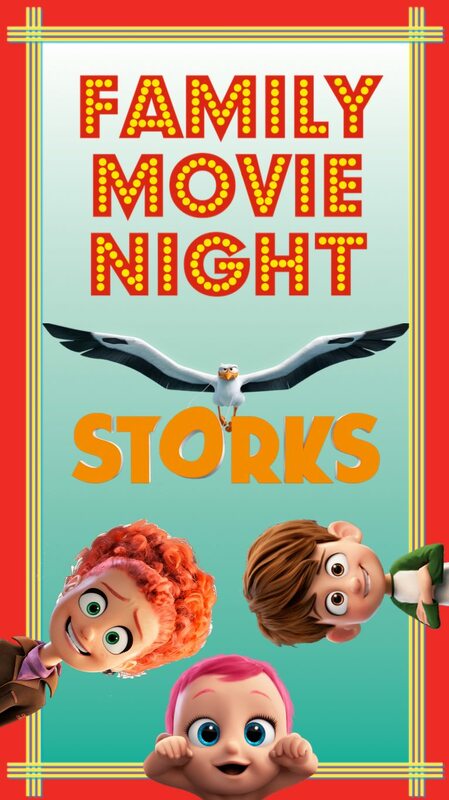 Storks won, I think mostly because it flew under the radar of most families when it was in the theater, so not very many families have already seen it. If you’d like to show Storks for your Family Movie Night, please take advantage of the promo clip and the graphics we created (down below). Then I sent out the link to the survey to the families in our church and gave them one week to participate in the poll. 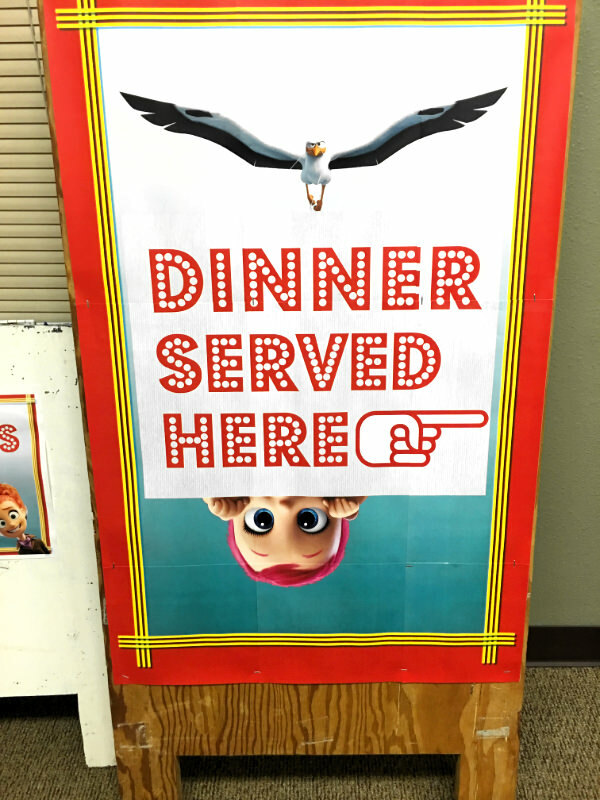 They voted for Storks, so we picked it, tied it to a free spaghetti dinner, and encouraged our church body to invite guests. Besides the free spaghetti dinner, we invited families to bring blankets, pillows, snuggies, etc., so they could get comfortable. Then we cleared out the center section of chairs in our worship center. That way, families that wanted to spread out on the floor together had plenty of room, and families that didn’t want to could sit in the chairs on the sides. And as families came into the movie, we handed each kid a raffle ticket and a Bingo card. The raffle tickets were for a drawing in which we gave away copies of the Storks DVD that they could take home with them and watch over and over. 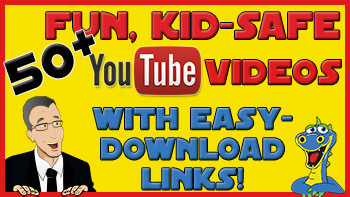 We also made a funny video, with kids talking about the movie night. (See the clip at the very top of this post.) We showed this in church, and in all the kid’s Sunday school classes. It really got kids and parents excited about the movie night. We also put it on Facebook, which turned out to be even more valuable. Tons of families shared it on their Facebook page, and that did a great job of getting the word out to their un-churched friends. If you’d like me to send a copy of the invitation cards and publicity video, just let me know where to email them using the form below, and I’ll get those out to you right away. 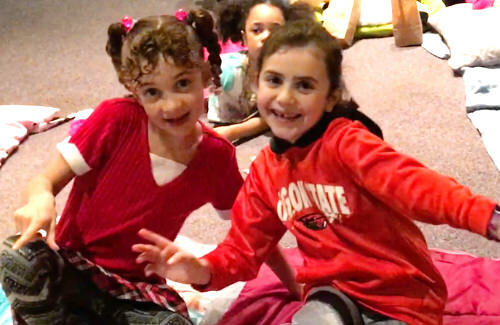 And for the promo clip - you can use it "as is," or you can film kids from your own church and splice them into the promo video in place of the kids from our church. Did it bring in un-churched visitors? Yes! For the first time in a long time, I probably only recognized about 60% of the people at the event. That means about 40% were guests! Awesome! A lot of that was due to our strong Preschool-Moms-Support-Group, but I also saw a lot of elementary-school families that brought friends along. 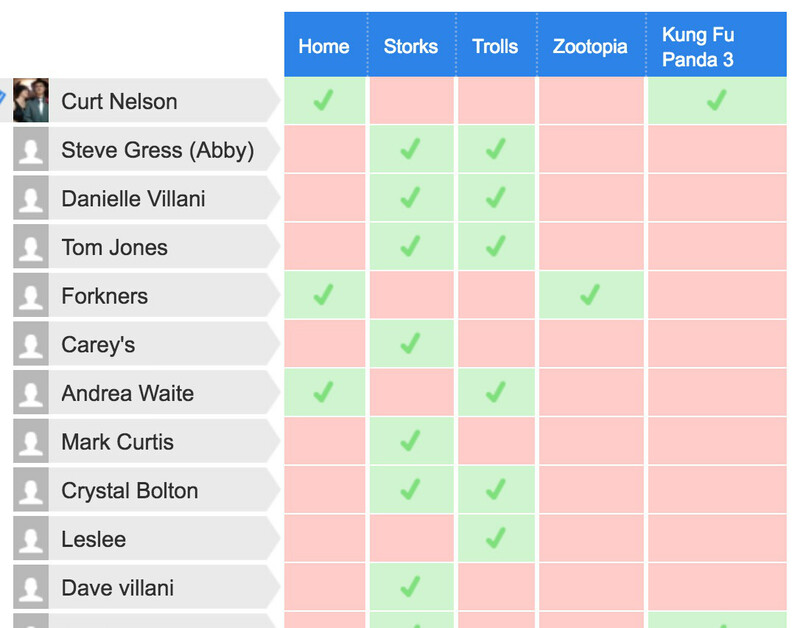 With results like that, we will definitely be doing a movie night twice a year from now on. 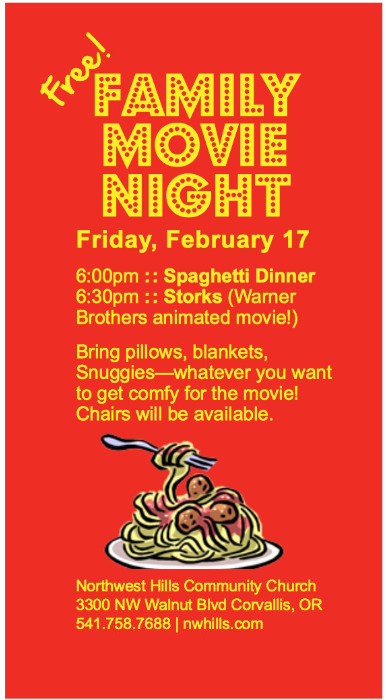 The spaghetti dinner was helpful because parents didn't have to rush home from work and make dinner before the movie. 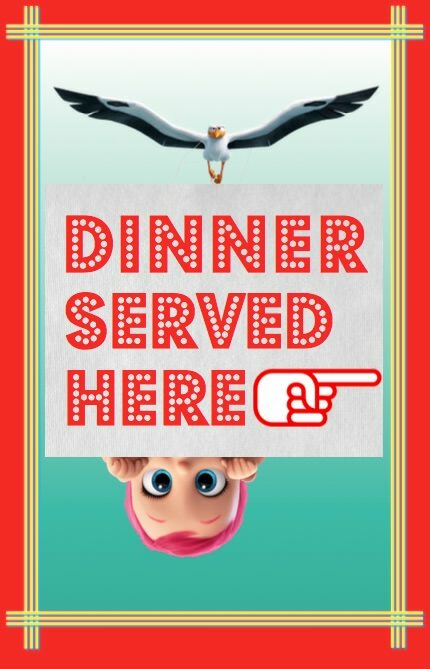 We were able to offer it for free (spaghetti is pretty cheap), and we didn’t charge for the movie, so guests loved it. (Plus no one could accuse the church of just being after their money.) I hope it goes without saying, but... don’t take an offering at an event like this! 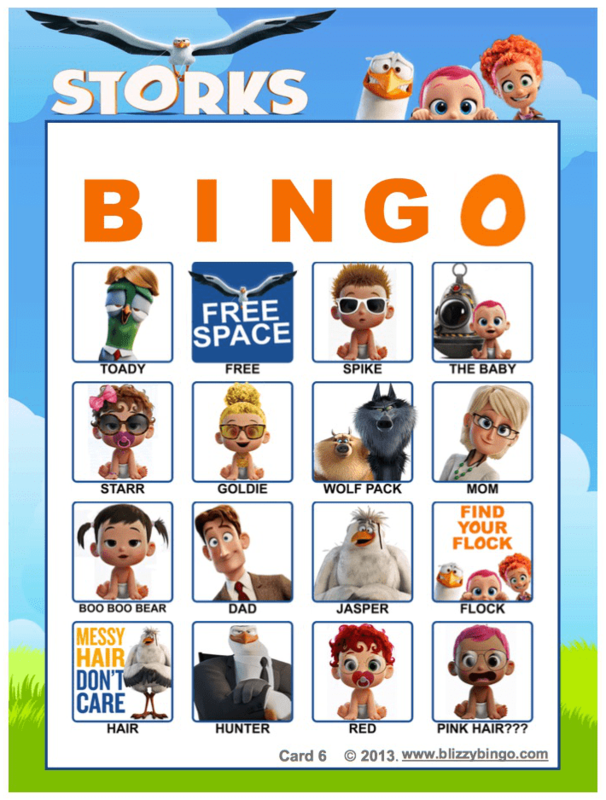 And I was a little worried about playing Storks Bingo before the movie. I was afraid that kids would just want to get to the movie. But the Storks Bingo was probably the biggest win for us. Kids LOVED it! 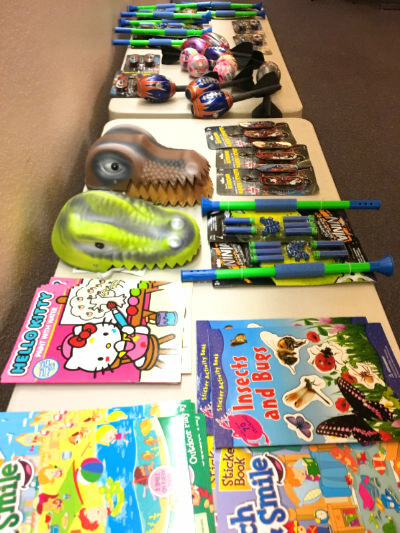 I bought $50 worth of prizes at the dollar tree (see below) and we just kept playing until the prizes were gone. We also rented a popcorn machine and made popcorn for all the kids, and bought mini-bottles of water. 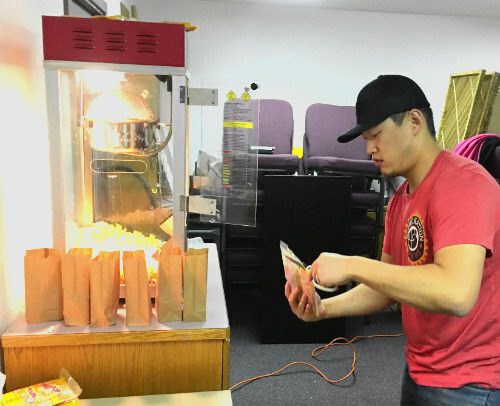 The popcorn machine rental was fairly cheap, and it definitely added to the “feel” of the movie night. To rent a machine like this, you'll have to check your local rental places, but look for something like this. I noticed a few preschool families got up and left half-way through the movie. That made me concerned that the movie I had picked was too “old” for a lot of the families there. So I followed a couple families out to the lobby (in a non-creepy way!) and asked them about that. They all assured me that the movie Storks was a great choice, and that their kids loved it, but that it was past their bedtime. And they also said that if I had picked a more “preschool-y” movie, like Paddington Bear or Curious George, their kids would have already seen it multiple times, and it wouldn’t have been as exciting as having Storks. 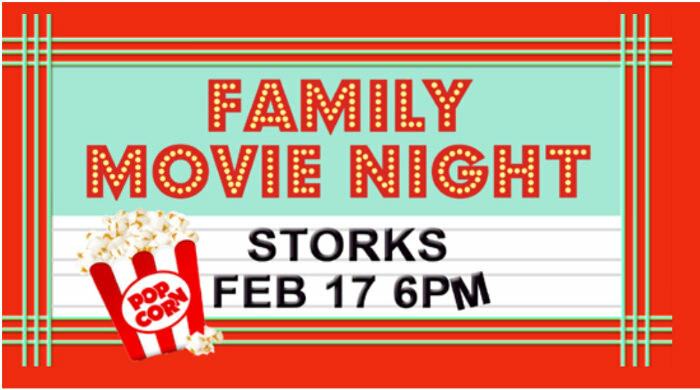 So… I encourage you to try a family movie night and see if you can get un-churched families to come check out your church, meet some friendly church-folks, etc. And please show the movie legally. Make sure you have a site license from a place like Church Video License International. (Your church probably already pays for this to use their worship songs, but it's worth double-checking.) And also remember that you can't use this license and charge admission to the movie -- it has to be a free event. If you have any questions about hosting this type of event, I’d be happy to talk with you. Just send me your questions here. Instead of providing a sit-down dinner, we'll give the kids a corn-dog and an Oreo cookie as they come into the movie. Okay, never mind, that's probably not a good idea. You didn't hear it here. *Note: All the Storks graphics and videos belong to Warner Bros and Sony Pictures, etc. Use them at your own discretion. I personally believe that they would have no problem with us using them to promote a showing of their movie, which we’ve legally licensed for public viewing.